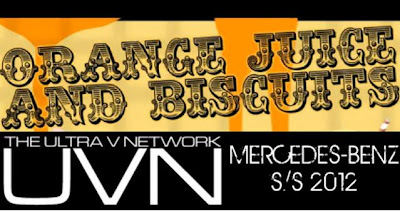 The Spring/Summer 2012 season of Mercedes-Benz Fashion Week was the first season that OJ&B teamed up with The Ultra V Network to bring you exclusive videos direct from the tents! Everyone in the fashion world is counting down the days to MBFW Fall 2012 and I thought it would be fun to take a look at the S/S 2012 season with OJ&amB's Fashion Week Flashback! Check out the video interviews that I did with fashion photographer Fernando Colon and Metrovelvet's U.S. Fashion Director Jhon Santos! Fernando talks about his favorite fashion shows he shot during the week and the some of the great new trends he saw. Jhon tells us which fashion shows he liked this year and talks about the new trends that he loves for the S/S '12 season. I am excited to announce that I will be working with The Ultra V Network again this season to bring you exclusive video interviews! Be sure to keep coming back as OJ&B takes you directly to the action of MBFW Fall 2012!